House for sale 5.2 M rent 35K. 2 storey house for rent, 4 bedrooms, 5 bathrooms, 1 maid room. House for sale near the beach full view. Sell or rent a beach condo in South Pattaya. 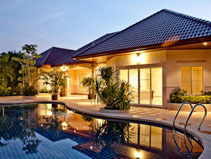 Rental house with swimming pool in South Pattaya area. Condo City Center Pattaya for rent. The set of prime ocean front behind the mountains. 2 storey Single house, 3 bedrooms, 2 bathrooms for rent.